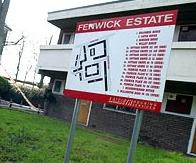 I was out on the Fenwick estate today. Many remember it as the place where Billy Cox, the 15 year old teenager was tragically shot and killed. I was out talking to people on the estate and handing out a crime survey along with some of the labour councillors for Larkhall (http://www.welovelarkhall.com/). We went past the house where Billy lived, and the memorial spray painted onto one of the walls of the estate. Despite some media perceptions, it certainly isn't a notorious estate, nor is it a crime ridden ghetto that many would portray it as. Most people we talked to felt fairly safe on their estate, even if they were aware of drug dealing on Landor road, or some gangs hanging round. One of the worst problems was some kids running along the roof space of the estate, disturbing the asbestos in the roof, a problem that was causing nuisance to some residents, but would be easily solved by a padlock. It makes you realise how important it is to have a good local councillor to sort these things, and someone who makes the effort to get out on an estate, when council officers rarely have the time. A family were also being tormented by a neighbour who played their music extremely loudly and hurled abuse at them through the wall. I perhaps clumsily set the person off by asking her to turn her music down (not too much to ask?) In the end, if she doesn't behave like a reasonable neighbour, you'll need to get an ASBO and maybe an eviction. It makes you realise that even so-called "minor" offences like anti-social behaviour are really important, and sorting them out can make people's lives much less of a nightmare.